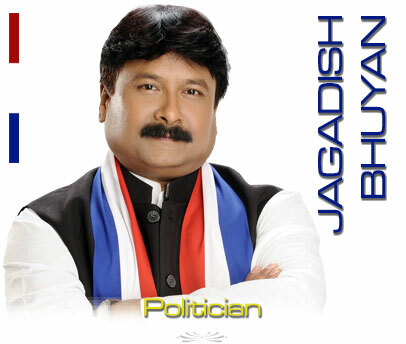 He joined active politics in 1995 by joining Assam Gana Parishad (AGP) and nominated as central executive member of it. In 1996 General Assembly Election he contested from Sadiya Constituency. He was elected as the youngest MLA at the age of 30 years. In the year 1998, he became the Minister of Tourism, Assam. In 2001, he was elected as MLA for second time. In 2004, he was nominated as spokesperson and member of steering committee of AGP. From 2008 to 2012 he was nominated as general secretary of the party. In 2011, after another poor showing of AGP in the state assembly election he along with some of his colleagues started a reform process of the party. His initiatives were supported by many leading intellectuals of the state. But he failed to motivate the top leadership to reform and restructure the party. In frustration some of his colleagues left the AGP and joined other political parties. Jagadish Bhuyan too resigned from the primary membership of AGP and joined Bharatiya Janata Party. He is currently the executive member of BJP, Assam Pradesh. On June 7, 2015 after stating "I have lost faith in the AGP which has become directionless and was shrinking each passing day. The BJP on the other hand is the right party to fight for the cause of Assam..." Jagadish Bhuyan along with several senior members of the AGP from Tinsukia district to join the BJP. Now he is the one of the Media Panelist of the party. He is currently the Chairman of Assam Petrochemicals Limited.